Growing up, beef stroganoff was one of my Gran’s signature dishes. I loved how warm and nourished I would feel afterwards and if I’m honest, I do miss it. But, as you will see at Haleo, we endeavour to replace old staples with other vege/cleaner alternatives, so we hope you like this one. Taste wise, this creamy dish has an explosion of flavour thanks to the coconut milk, vegetable stock, smoked paprika and garlic. 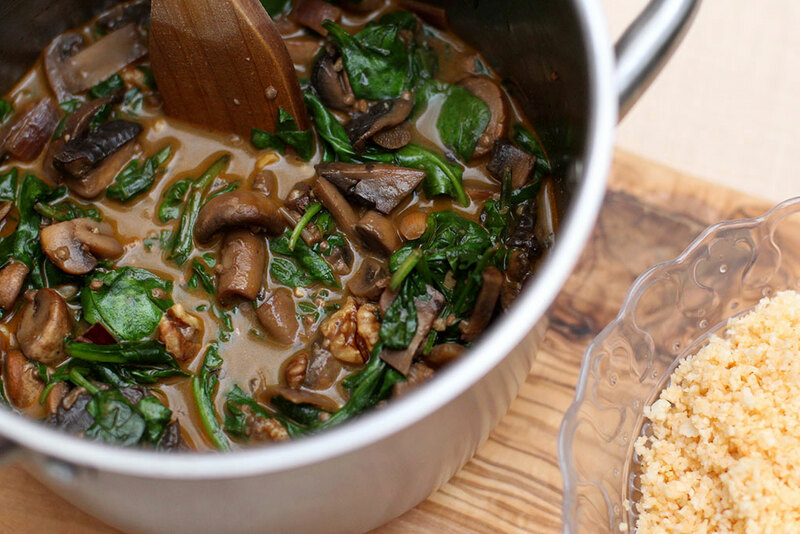 The spinach works as a good base with both the selenium-rich mushrooms and red onion whilst the walnuts add a real crunch to the dish. If you’re not a fan of walnuts, please feel free to leave out (but I think they really add something here). We love to serve this with cauliflower rice (but we add smoked paprika to the rice as it really gives it flavour). Cut the mushrooms into quarters followed by dicing the red onion. Place a medium sized pot over a medium heat and melt 1 tbsp. of coconut oil. Add the red onion, crushed garlic and smoked paprika. Sauté until the red onion is soft and then empty the mixture into a small bowl and set aside. Add a further tbsp. 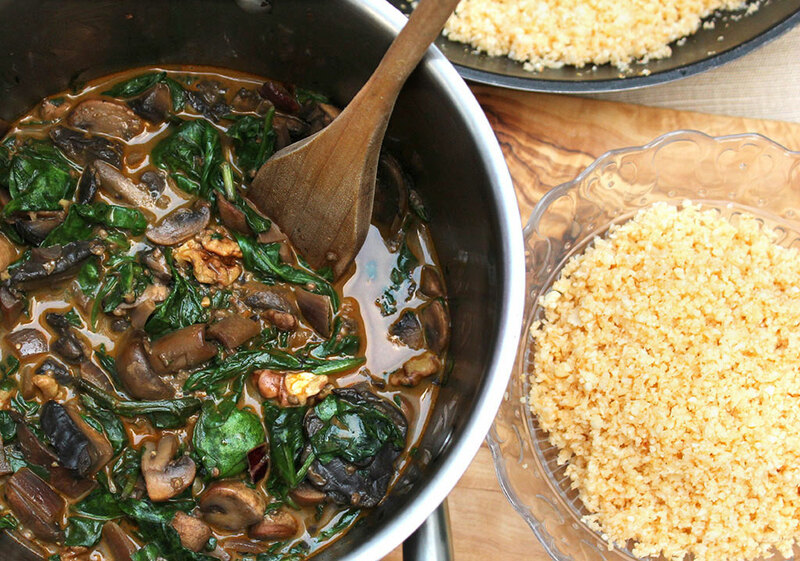 of coconut oil to the pot, followed by the mushrooms and gently saute until nice and juicy. Mix the coconut milk with the vegetable stock and pour into the pot followed by the chia seeds. Simmer for 10 mins on a low heat, stirring well. 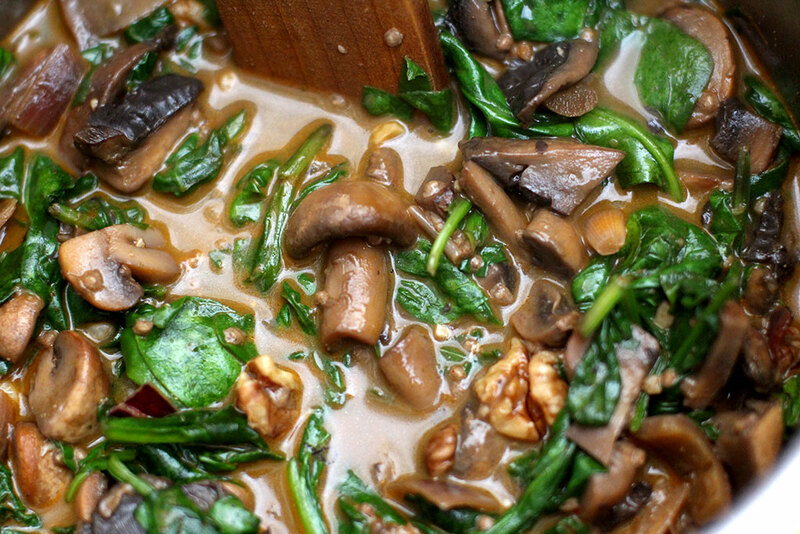 Add the walnuts, bowl mixture, then spinach and heat until the spinach is wilted. Add some chilli flakes if you fancy a bit of a kick!